Joe Namath became a household name when he brazenly guaranteed a victory over the heavily favored Baltimore Colts in Super Bowl III. 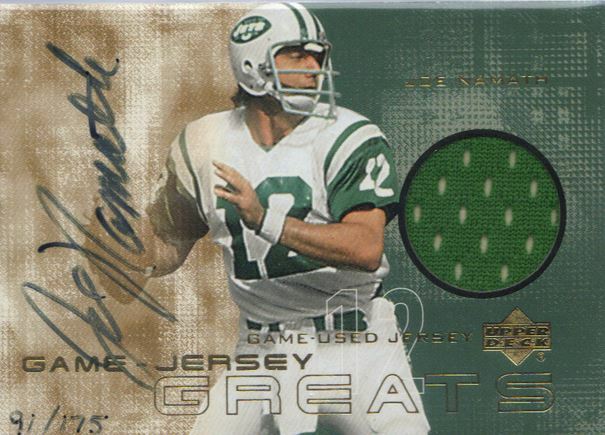 That signature moment, to this day, is one of the leading reasons that Joe Namath football cards and autographed memorabilia are still popular today. Broadway Joe, as he was nicknamed, helped change the face of football through his outgoing personality, night-club lifestyle and winning play on the field. He was the first football player to make the cross-over from the gridiron to Madison Avenue by bringing commercial and endorsement opportunities to the then young NFL. 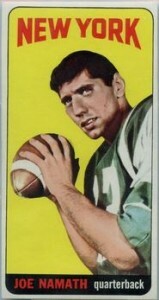 Joe Namath's rookie card was released as part of the 1965 Topps Football set. Affectionately referred to as Tall Boys for their oddly sized cut, Namath's card can command tens of thousands of dollars on the secondary market when presented in high grade. As a result, even lesser conditioned cards can sell for four figures. In addition to his 1965 rookie card, Namath also has two team issued cards from the same year. However, both cards are more photographic in nature and measure in size accordingly with one being 5x7 and the other 8x10. For completists wanting to ensure they have every early Namath piece, they will need to track down his 1965 Coke Cap as well. A true ambassador of the game that still lives a very public lifestyle, Joe Namath has always been a willing and gracious in-person signer. He provides a one-of-a-kind signing experience with that signature smile and boisterous laugh. A frequent participant in organized signing events, mini-helmets and photographs are some of the items he is most frequently asked to sign. Items from his playing days, including original advertisements, carry a premium value. Measuring 2 1/2 by 4 11/16 inches, these uniquely sized cards are a favorite of vintage football card collectors. 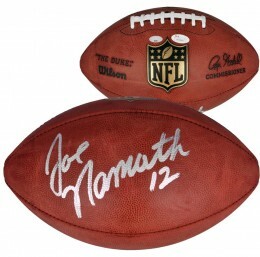 Having a legendary rookie like Joe Namath on the checklist only adds to their desirability. 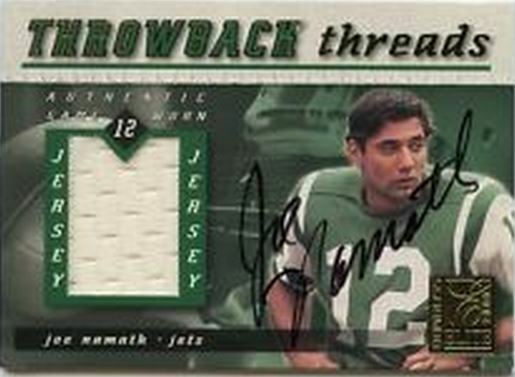 The card shows a close-up image of Namath set against a bright yellow background. It was one of several short-printed cards which significantly adds to the cards collectibility. Namath shared the origins of the photo during an interview with David Letterman where he explained how the shot was captured in a hospital. Hard-signed and hand-numbered to 2,500, the release of this card captivated the hobby and again showed the innovations Upper Deck was bringing to the trading card marketplace. 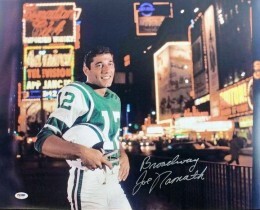 The artistically styled card design features three different images of Namath. This was his first officially licensed autograph card. By the year 2000, the memorabilia/relic craze was in full swing. Companies were competing to include game-used materials of the best players in trading cards and collectors were loving it. 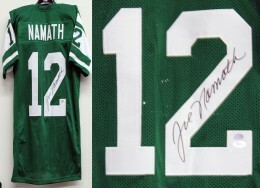 That year, Joe Namath had nearly a dozen different memorabilia or autograph memorabilia cards produced. This one, from Donruss Elite, is serial numbered to 100 and includes an on-card signature and a material swatch from one of Namath's game-used jerseys. 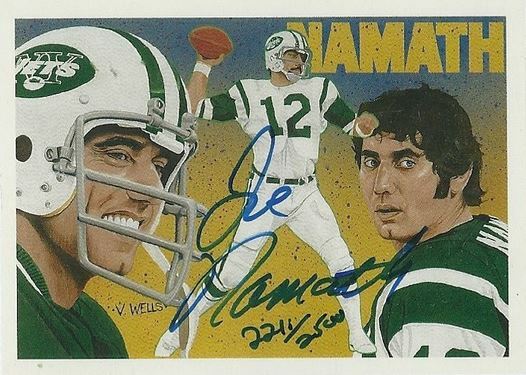 Another very popular card from the first year that Joe Namath had memorabilia cards produced, this is one of two versions of the card in the set and is serial numbered to 175 total copies. (#271 300) PSA DNA SP Dual Auto John Elway Joe Namath Signed Autograph 3.5" X 5"
Below you will find examples of what an authentic Joe Namath autograph looks like. This can be used as a first point of reference for determining the legitimacy of autograph memorabilia, but is not a substitute for having your items authenticated by a well-respected professional autograph authentication company. Some of the trusted sources within the sports memorabilia market include the following companies: PSA, JSA, Steiner, Tristar and Mounted Memories. Click on any of the images below to view full size photos. A very legible and even handed signature written on an even horizontal plane. The use of cursive script displays a pride of penmanship. The defining characters are the letters "J" and "N" which are larger than the other letters. The "J" consists of a narrow, sometime pointed loop on top and a backward looking "D" on the bottom. The letter "o" and "e" are legible with both letters being closed; the pen lifts to start the last name. The letter "N" starts with a small hook on the top left and the up/down line forms an elongated loop. The pen lifts and all the letters of the last name are legible with closed "a"'s and clear humps to the "m" and an "l" style "t" crossed equidistant on both sides. He often inscribes his jersey number "12." 1971 TOPPS JOE NAMATH #250 PSA 6 A CLASSIC HALL OF FAMER'S CARD AWESOME L@@K !